… but the one that is invading my consciousness more than most at the moment is Berkeley Professor of Public Policy and former US Secretary of Labor Robert Reich. 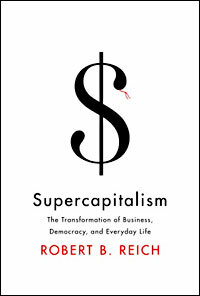 I’ve just bought his latest book Supercapitalism which looks at the conflict between capitalism and democracy, arguing that companies have taken over the political arena and citizens are increasingly excluded from the lawmaking process. A more erudite review of the book is available from Stanford Law Professor Lawrence Lessig or you can hear directly from the author, when he was on National Public Radio as part of their Book Tour series. He writes regularly at Robert Reich’s Blog and also appears as a commentator on TV and radio. Explore the Google Video archive of Robert Reich appearances and you’ll see that while he does the circuit of news organisations, he does have a sense of humour – regularly popping up on the late night talk show circuit with the likes of Jon Stewart and Conan O’Brien. But in more serious arenas, he recently delivered a keynote address on The Art of Leadership and the Practice of Teaching at Berkeley and spoke at length about The New Shape of Capitalism to Come. Reich has that gift of being able to explain economic concepts in terms that the non-specialist can understand, but without dunbing down his arguments. Intute: Social Sciences features more Internet resources on the topics of Labour Economics, Political Economy and Economics.